One of the distinguishing features of political Islam in the early twentieth century was its call for the creation of an Islamic state. Methods and strategies might differ, but the aim remained the same. The structure of the state was conceptualised in the light of Islamic principles – as drawn up by the classical Sunni and Shiite traditions – and articulated around the core concept of “Islamic law,” meaning the concept of Shari’ah. It was no accident that late nineteenth and early twentieth century Islamist organisations expressly sought to revive Islam’s social and political heritage. It was only normal for the movements that identified themselves as Islamic to organise their action in pursuit of two priority objectives: the national and state structures that had been imposed upon them in the aftermath of the 1885 Congress of Berlin and the potential for transnational dynamics, as reflected in the pan-Islamism of Jamaluddin al-Afghani and later, of the international expansion of the Muslim Brotherhood at the time of Hassan al-Banna. To the Islamists of the day, the Islamic state comprised the threefold response – religious, political and cultural – to the imposition of western models, and was understood as a call to resistance to the plans of the colonialists who were, in turn, seen through the prism of imperialism, and whose aims seemed crystal clear: consolidating the political and economic dependence of the colonised countries, enforcing secularisation, fighting Islam and traditional cultures in general. Confronted with a multidimensional threat of this magnitude, the Islamists were convinced that only by referring to Islam could they resist western imperialism and the three-pronged assault of colonialism – a perception shared by all Islamist movements. The state, defined as “Islamic” was, according to them, the only structure that could ensure the political independence, religious identity and cultural specificity of the emerging Arab state entities. It was an ideological response which must be assessed in the light of the prevailing issues of the day. The same pattern prevailed until the Iranian revolution, which would be the last revolutionary expression of political Islam within the strict framework of the nation-state in opposition to a pro-western dictatorial regime. The Iranian experience, failing as it did to fulfil the idealistic aspirations of many Islamists, was to have a powerful impact on both Shiite and Sunni movements and organisations. Factors like globalisation, the absence of a genuine pan-Islamic movement and the emergence of new forces explain why the understanding, the vocabulary and even the objectives of the Islamists have taken new forms. Some Muslim scholars and leaders – like Shaikh Yousuf al-Qaradawi or Tunisian leader Rachid Ghannouchi – have readily accepted the democratic principle. For them, it is not in contradiction with the idea of Islam as a political project. Still, the Islamist leader of the Algerian Hamas party, Mahfoud Nahnah, appears to have been the first no longer to speak of an Islamic state but of a civil state. It was not long before several Islamist movements replaced “Islamic” with “civil” in describing themselves, all the while avoiding terms like secularisation, secularism or non-denominational as such concepts continue to carry a negative connotation in the broad Arab and Muslim conscience. In his on-the-spot, and highly optimistic, analysis of Egypt’s 25 January 2011 uprising, left-wing intellectual Mohammad Imarah emphatically affirms that the Islamic state is a civil state, which, he adds, must be based on institutions and on consultation (shura) and that the operative decision-making process requires that its authority be civil in nature. For him, the civil state must administer majority preferences through the categories of “right or wrong” and not through those of “faith or of its rejection”, in full recognition of the plurality of religions and political ideas. Some Islamic movemen leaders, like the former Muslim Brotherhood Abdul Moneim Abul Futuh in Egypt or Ghannouchi echo the position taken by the Moroccan movement Al Adl Wal Ihsan (Justice and Excellence Party) whose priority, as Shaikh Yassine’s daughter Nadia Yassine explains it, is to found a democratic republic as opposed to the monarchy. The movement is now on record as preferring a civil state, according to its spokesman Fathallah Arsalane, a statement that confirms that Islamist leaders seek to distance themselves from the notion of “secularism,” seen in the Arab world as shorthand for westernisation, while steering clear of the idea of the “Islamic state,” stigmatised by its cumbersome baggage of negative connotation. The Iranian experience has created the widespread impression that an Islamic state would be a kind of theocracy run by a clergy-like apparatus similar to Iran’s Shiite hierarchy. The perception is so widespread that Islamists have been compelled to revise their terminology and define their concepts more precisely. When referring to recent experience, they more often prefer the Turkish model to an Iranian-style revolution. 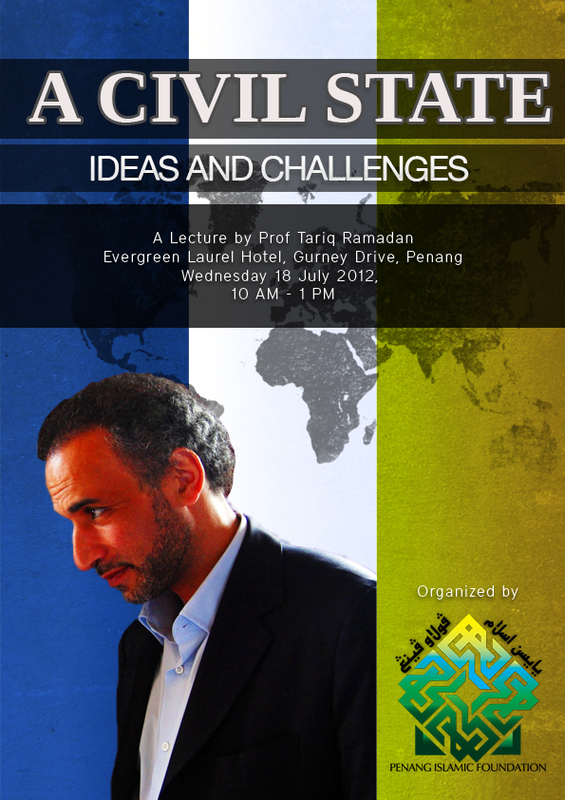 Tariq Ramadan adalah Profesor Pengajian Islam Kontemporari di Universiti Oxford (Oriental Institute, Kolej St Antony) dan juga mengajar di Fakulti Teologi Oxford. Beliau merupakan Profesor Pelawat di Fakulti Pengajian Islam, (Qatar), Felo Penyelidik Kanan di Doshisha University (Kyoto, Jepun) dan Pengarah Pusat Penyelidikan Perundangan dan Etika Islam (Doha, Qatar). Beliu juga merupakan cucu kepada Hasan al- Banna, pemimpin utama Ikhwan Muslimin di Mesir. Beliau memegang Ijazah Sarjana (MA) dalam Falsafah dan kesusasteraan Perancis dan PhD dalam Pengajian Arab dan Islam dari Universiti Geneva. Di Kaherah, Mesir beliau menerima latihan intensif (talaqi) daripada ulama di Universiti al-Azhar dalam bidang pengajian Islam klasik. Melalui karya tulisan dan ceramah beliau Tariq telah menyumbang kepada perbahasan mengenai isu-isu umat Islam dalam kebangkitan Barat dan Islam di dunia Islam. Beliau aktif di akademik dan peringkat akar umbi dengan mengajurkan syarahan secara meluas di seluruh dunia dalam bidang teologi, etika, keadilan sosial, ekologi dan dialog antara budaya dan agama. Beliau juga adalah Presiden kepada sebuah badan pemikir: European Muslim Network (EMN) di Brussels. Buku terbaharu beliau: “The Arab Awakening: Islam and the New Middle East” Penguin (Spring 2012); “The Quest for Meaning, Developing a Philosophy of Pluralism” Penguin (2010); “What I believe” OUP USA (2009); “Radical Reform, Islamic Ethics and Liberation” OUP USA (2008).